VisionPlus (VP): What should the participants expect this year at the Vision-X? Asma Al Sharif (AS): Vision-X is the region’s largest eyecare, eyewear and optical health business exposition. As such, we’ve seen an influx of new exhibitors to the show this year. Notably, a country like Turkey decided to double up the number of exhibitors under the Turkish pavilion, a first for the show. Participants can also expect returning exhibitors from Germany, Italy, and South Korea to showcase a range of products. Additionally, many of the major brands and luxury names that dominate the industry will be displaying their latest designs. VP: How do you think the industry has benefited from the Vision-X VP awards? AS: We believe it is important to highlight and celebrate companies that are at the cutting-edge. The Vision-X VP Awards are a great way to recognise outstanding achievements in the optical industry. The winners, and even those shortlisted, have developed concepts that will pave the way for future designs in the market. Last year saw iconic British designer eyewear brand Linda Farrow take home the Special Jury Award. The brand’s exclusive pair of yellow gold aviator style sunglasses, designed to represent timeless style, uncompromising quality and unabashed luxury – were chosen by the region’s eyecare professionals for this, the most coveted award of the night. Essilor International also dominated in 2015, taking home three awards, underlining their reputation for manufacturing state of the art contact lenses. VP: In your opinion, why should brands exhibit at the Vision-X? 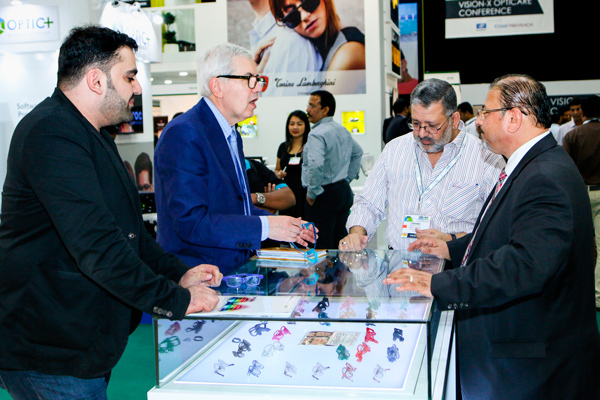 AS: As the largest gathering of eyecare and eyewear experts in the region, Vision-X provides a platform for exhibitors to network with individuals and companies on an international scale. The optics market in the GCC alone is valued at almost US $2 billion. We are seeing more and more professionals in the industry looking to capitalise on the opportunities in the region by visiting and exhibiting at Vision-X. VP: This year, Vision-X marks its 17th anniversary. What are some key changes that have helped the platform grow? AS: The show has grown considerably since its inception 17 years ago and is constantly evolving to meet the demands from the industry. We have introduced new features to support burgeoning areas of growth, such as the Style Atelier, the Future in Focus and Retail Theatre and the Vision-X VP Awards. More than 450 optical stores have opened in Saudi Arabia and the UAE since January 2012 alone and the latest market research indicates that there is a positive outlook for the demand for eyecare products. As the industry becomes more innovative, Vision-X will mirror those advances and continue to provide the ultimate platform to connect and establish new working relationships for the eyecare sector. VP: What is the focus of the OPTICARE conference this year? With three days of professional training, debate and hands-on skills from leading regional and international practitioners the Opticare conference will feature a series of dedicated workshop for optometrists. VP: What are some topics that will be addressed at this year’s Future in Focus sessions? AS: Vision-X will return to host its Future in Focus educational seminars, sharing keen insight into a selection of topics within the optical industry. Global experts will be taking part in the seminars, highlighting their technological solutions for the sector. This forum is designed exclusively for business owners and managers. And the programme is set to help them improve their operations and brings the latest in eyewear trends, tech and customer care for retail profits from global experts. VP: Are you expecting any repeat customers for this year’s Vision-X event & why? AS: Many of the companies who exhibited last year are coming back for the 17th edition of Vision-X. On top of this, we have noticed a large influx of new companies, from Turkey, South Korea and China, booking space this year. Last year we welcomed more than 4,000 visitors from over 70 different countries to the show and we expect to match or exceed those figures this year. We always provide something new for participants to experience at the show and 2016 will be no different. AS: Vision-X is the gateway to the MENA optical market, which has most recently been valued at US $2.67 billion. A report conducted by global market research organisation GfK, which analysed data up to the end of 2015, found that the MENA market offers vast potential to opticians, eyecare retailers and professionals. This will be possible because of the expected 26 percent increase in the regional population by 2030 compared to 2015, according to the UN World Population Prospects.